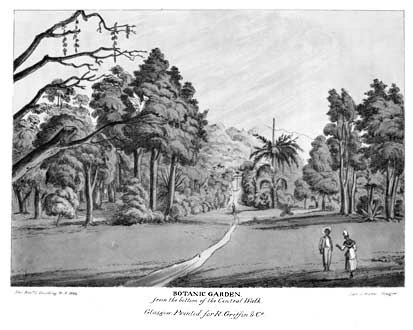 1824 print of the Botanic Garden in the Island of St.Vincent. GUILDING, Lansdown - An Account of the Botanic Garden in the Island of St Vincent, from its First Establishment to the Present Time. (Glasgow) 1825. The history of St Vincent. An agricultural work. A botanical study. The first great WI botanical garden. BOTANIC GARDENS: These gardens are the oldest in the Western Hemisphere. Established in 1765, they cover 20 acres and are overlooked by the Governor General's House. Among the many tropical plants can be found a descendant of the original Breadfruit tree which Captain Bligh brought to the island. There is also a tree, the SPACHEA ELEGANS, better known as the "Soufriere Tree", a species unique to St Vincent and not found in the wild since 1912. "This garden seems to owe its origin to certain advertisements in the transactions of the society of Arts, for 1762, and the four following years, offering rewards to any one who should cultivate a spot in the West Indies, in which plants, useful in medicine, and profitable as articles of commerce, might be propagated: and where nurseries of the valuable productions of Asia, and other distant parts, might be formed for the benefit of his majesty's colonies. General Melville, who was then Chief Governor of the ceded islands, while he resided in St.Vincent, with a laudable and patriotic zeal, resolved to commence the task; and in 1765, gave, and cleared at his own expense, twenty acres of land in the most favourable situation he could find, about half a mile distant, in a northerly directions from Kingstown, and abundantly supplied with water. Dr. George Young, Surgeon to the forces, the principal medical officer stationed in the island, was first entrusted with the charge of the ground, which he held for many years". "In December, 1792, Captain Bligh touched at St Helena on his return, and in January, 1793, attended by Captain Portlock of the assistant brig, landed the best portion of his valuable cargo, about 530 plants, on the shores of St Vincent. The young trees which were as vigorous as if they had only travelled from our mountains, instead of having crossed a wide and troubled ocean, were instantly planted out, and after a proper interval distributed among the colonies. Having performed this duty, Captain Bligh proceeded to Jamaica where another portion was delivered, and with the remainder (destined for his Majesty's gardens at Kew) set sail for Europe. The total number of plants delivered amounted to 1,217; besides, there were 700 reserved for Kew. In 1794 the bread-fruit began to bear." In an Appendix there is a letter, dated June 9, 1806 from Alexander Anderson (a surgeon, who was appointed Superintendent of the St Vincent Botanic Garden) to C. Taylor, M.D. Secretary of the Society of Arts. "The bread-fruit although one of the most valuable productions yet sent them, is neglected and despised, unless by a few persons (Note the word "them" here refers to planters in different islands). They say that Negroes do not like it, and will not eat it, if they can get anything else; but this is not really the case, as I know, and can declare from experience, that the very reverse is the fact, when once they are a little accustomed to it. The fact is the planters hate giving it a place on their estates, as they regard it as an intruder on their cane land, and dislike any other object but canes." The book also makes reference to more than one type of bread-fruit one with prickles and one without. My father-in-law, John Manning (Jackie) Cave, an agricultural consultant in various islands, who died some years ago used to narrate a tale about a visit from Princess Margaret to St Vincent in the late 1950's. She had wished to see a bread-fruit. It wasn't the season, but somehow they managed to procure a few and tied them onto one of the trees. He didn't think she was fooled, but she was too polite to make any comments. Superintendent's house. I believe it had been found on the slopes of Soufriere and had been transplanted. Does anyone know if it still exists and if a partner was ever found? "About nine o'clock at night of the 23rd of January 1793 arrived in Kingstown Bay the long wish'd for Providence, Captain BLIGH, from the South Seas with the breadfruit and other useful and curious plants. The voyage was remarkably short and in every respect prosperous. Such a number of live plants were never before seen on board a single ship. On her arrival she was one of the most beautiful objects of the kind it is possible to conceive. Such a number of live plants of many different kinds brought from the remotest parts of the globe in such a state of preservation and carried through nearly all the climates of it was surprising to behold. Too much praise cannot be given to Captain BLIGH for his great attentions to the chief object of his mission nor to the two young men who had the collecting and immediate management of them. Nor is it less surprising that the share of them allotted to the Gardens have arrived to such perfection in so short a time in it. Some of the bread! fruit plants began to produce fruit at the end of eighteen months from their arrival. In two years and three months all the fifty plants reserved in the Garden produced a large crop. This will appear the more surprising as the half left here were the smallest and the most sickly looking plants. The largest and most healthy in appearance went to Jamaica. In this division there appeared partiality; however, I conceived it just and could not with propriety object to it, as there was still the risk by sea of ten or twelve days passage from St. Vincent to it. Therefore necessary for their preservation, the weakest and most probable to suffer by continuing them in their confined situation should be landed as soon as possible, and I was confident that out of the number of 300 plants I should be able to preserve sufficient as a nursery for the Windward Islands." Those familiar with St. Vincent's history know that the 2nd Carib War started 10th March 1795. He and a few slaves would spend the night in a fort and continued to maintain the Garden during the day. And to think suckers of those 50 plants produced so much.